Today is Chinese Mid-Autumn Festival, and the in-laws are coming over for dinner tonight to celebrate. We’ll have a standard hot pot dinner, which is perfect for the cold fall weather. But for dessert, I’m forgoing the traditional egg yolk filled mooncakes (which I really don’t like) in favor of a Western dessert. To pay homage to the egg yolks, that represent the full moon, I’ve added peaches to capture this symbolism. To be honest, this dessert is what I’m calling my plan C. Plan A was a mango pudding that I made last night. I tasted it this morning and didn’t like the flavor. The mango flavor just didn’t come through well enough, and I didn’t want to serve a subpar dessert. Plan B was to be an almond pudding, another Chinese dessert, but I feared its outcome as I hadn’t made it before either. Instead, I skipped Plan B and went directly to Plan C, this wonderful little tart. The buttermilk blueberry tart recipe comes from Epicurious, and it turned out perfectly. The dough was a snap to make in the food processor, and I was thankful that this recipe helped me finish a carton of buttermilk used to make waffles last weekend. 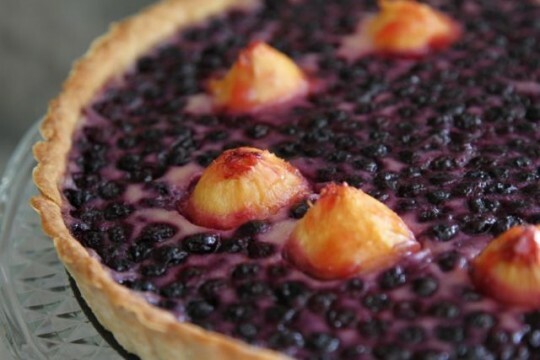 I substituted frozen wild blueberries for fresh ones, and I thawed and drained them before adding to the tart shell. I used a melon baller to scoop globes from a semi-firm peach. Eight is a significant and lucky number in Chinese customs, so I made sure to use 8 moon-shaped balls. Unfortunately, as I placed the tart into the oven, my peach moons each moved in their own orbit and shifted out of place. I reached into the hot oven in an attempt to arrange them perfectly, but I failed. Let’s face it, I don’t need a scorched arm, and when all else fails, call it rustic! I’m anxious to see how the tart will taste. It’s sitting on the counter and will be served this evening. Oh, how I hate waiting. I loosely covered it with foil so I can’t see it. Maybe if it’s out of sight, I won’t think about it? Maybe. Delicious – it tastes like cheesecake! Everyone loved it – the crust is firm, yet flakey and rich. The buttermilk filling gives it a cheesecake flavor while having a lighter, custardy texture. Note: Drained frozen blueberries worked perfectly in the recipe. The only downside is that they are already juicy, and the juice bleeds into the milk mixture as soon as you pour it into the tart.